As The Year Comes To An End. Comment on "Were These Our Babies"
Our Next Meeting 13th November 2010. Our Next Meeting Saturday 24th July 2010. WERE YOU BIRTHED OR SCHEDULED? OUR FIRST SUPPORT MEETING FOR 2010. .."The room was blacked out. There were no windows and just one door. "They tied my hands and feet to the bed. I was in agony. I was screaming out in pain. Advertisement: Story continues below "No one would have known a baby had been born. But I did." There, in an isolated delivery room of the Royal Brisbane Hospital, Trish Large's quest to find the son taken from her at birth began. Trish would be among 250,000 unwed mothers of the "white stolen generation" in Australia. The young women were drugged, tethered to beds, and never allowed to see their babies. It was a practice which has been described as 'institutionalised baby farming', whereby babies born to unwed women were forcibly taken from them and illegally adopted to infertile couples. This was the accepted practice at the RBH for up to five decades from the 1930s. As she prepares to celebrate Christmas with her family tomorrow, Trish remembers a time when her family was incomplete. “The nurse told me I was unfit to be a mother ... that I didn't deserve to see my son,” she said. “My son was whisked away out of the delivery room and I was taken to an unmarried mothers' ward in the hospital. However Trish, at 20 years old with no family for support, was no match for the system. “The next day my milk came flooding in. So they forced me to wear an extremely tight elastic bandage that covered my entire chest right down to my hips," she said. “It was so tight I could barely breathe. Trish has since learned the drug is used to treat incontinent female dogs. “The next morning a social worker came in and demanded that I sign an adoption form. When I refused she told me I would be charged with 'seduction' and deported back to England and never allowed in the country again with no chance to see my son,” she said. The same happened the following morning, and the following. Finally, the seemingly exacerbated social worker told Trish she could sign a hospital release form and take her son home. “I was so excited. I thought I had won. I thought I had beat them at their own game,” she said. “The social worker came with some forms on a clip board and I signed them. Then I sat on my bed and waited and waited for them to bring me my son. “I sat there until they put another woman in my bed. “At five o'clock I asked the nurse for the final time when my son would arrive. The following morning Trish – now a desperate mother – went to the Department of Child Services seeking help. Her plight fell on deaf ears. “So I marched right to the police station on Roma Street and told them my baby had been stolen from me," she said. “The policeman at the desk said he would need some proof that I had in fact had a baby. “So I went back to the Royal Brisbane Hospital. I said to the woman at reception, 'I had a baby here, I would like my records'. I gave her me name. Two years earlier Margaret Hamilton, now 64, delivered her son in the same ward. “But I have absolutely no memory of giving birth. I have no idea how my son came into this world,” she said. “Perhaps it was such a traumatic experience I blocked it out ... perhaps I was drugged. There, Margaret lived with 50 other young women, all pregnant and unmarried. “No one asked me what I wanted to do,” she said. On the May 11, 1966 Margaret was admitted to hospital. “I was left on a bed in a corridor. I heard another woman scream and I thought, 'Oh I don't want to be like that',” she said. “My friends tell me I must have had such a traumatic experience there I have blocked it out. But I can't imagine I would do that,” Margaret said. Like Trish, Margaret was forced to sign adoption papers, but not before she caught a glimpse of her son in the hospital nursery. “Yes, I saw him through the window ... but I was never allowed to hold him, or touch him,” she said. “The adoption was illegal. I was only 19. It was not legal for a woman to consent to adoption until they were 21. Once Margaret signed the adoption papers she was told she needed to leave the hospital. “I was expected to return home, return to my job and never speak of it again,” Margaret said. In the weeks following the birth Margaret became increasingly depressed. “I didn't care whether I lived or died,” she said. Eventually Margaret could not bear her life in Brisbane. Margaret moved to Melbourne where she regained some semblance of a normal life. It was not until she returned to Brisbane, married and with two children, in 1990 that she once again yearned for her lost son. “I wasn't coping. I had to find him,” she said. Margaret, like Trish, found an ally in ALAS Queensland – Adoption Loss Adult Support – for mothers searching for their lost children. One year later Margaret saw her son again for the first time. “He was not the baby I saw in the hospital. He was a man. He was 25 years old,” she said. The pair met at a country fair in regional New South Wales. “There were people everywhere and I was so scared I would miss him," she said. There for the very first time Margaret held her son. Margaret and Trish are among the fortunate few who have been reunited with their children, but their grief for the babies they lost has never faded. “The grief never goes away. Adoption is a life sentence,” Margaret said. She finds comfort remembering walking the streets of Brisbane's CBD when she was pregnant. “I loved being pregnant, because then my baby was mine and no one could take it from me," Margaret said. For this, a formal apology from the federal government is crucial. Margaret made a personal request to Prime Minister Julia Gillard at a community cabinet meeting at Clontarf, north of Brisbane, last month. "My name is Margaret Hamilton," she began. 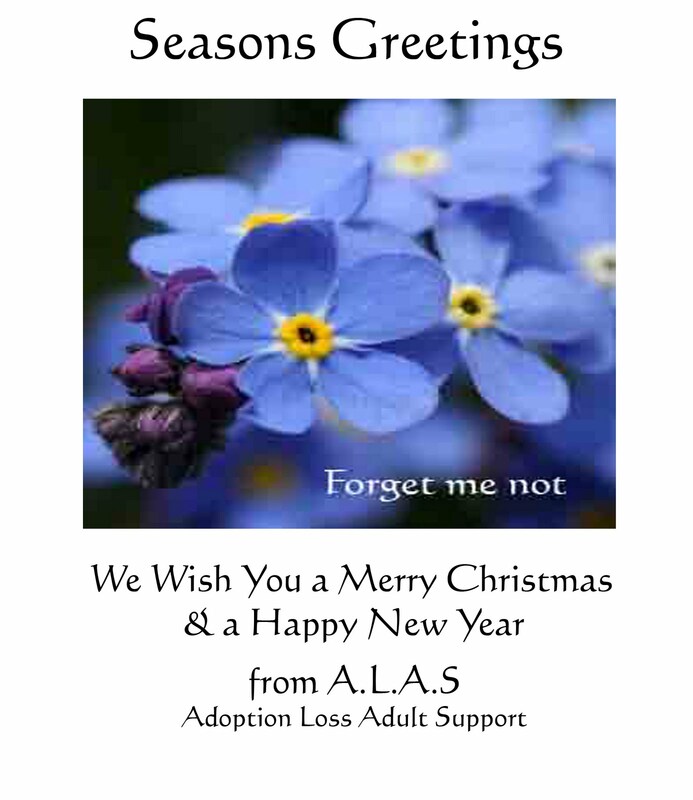 "I'm from ALAS - Adoption Loss Adult Support. There are over 250,000 white mothers who lost their babies to forcible removal at birth by the same past illegal adoption practices as Aboriginal mothers. "How do you feel personally? Should they receive an apology?" Ms Gillard replied: "I see in the media - and have heard sometimes face to face - some of the stories of women who face very devastating circumstances of having children taken, or being put under intolerable pressure to relinquish their children, in a different age and a different time. "So, as a human being, of course you extend your sympathy to anybody who lived through that and through years of not knowing what happened to their child. So I think it's something we can all say, we're sorry that ever happened in Australian history." Although this was cause of much excitement for Margaret and Trish, this personal “sorry” from the Prime Minister was not enough. “We want our children to know that we did not give them away. We want them to know that they were loved and wanted,” Trish said. The "white stolen generations" are so-called to distinguish them from the indigenous stolen generations, but their suffering is shared. Margaret last year received a handwritten letter from an indigenous elder. "I applaud the Prime Minister's apology to our mob. But what about the white stolen generations that have suffered the same fate," the elder wrote. "I know many white people who went through the same pain. So why can't the government do it's healing again and apologise to the white stolen generation to bring closure to all this suffering. "As we walk the same land. Breathe the same air. Drink the same water." On page 14 of this morning's Sydney Morning Herald, Liz Hannan writes "White mothers of stolen children also deserve an apology" article. In an attempt to revive her battered image with Queensland voters, Julia Gillard and a dozen ministers and parliamentary secretaries journeyed north last week to convene a ''community cabinet'' in a school hall in the marginal Labor seat of Petrie. Little was expected of the evening. The Prime Minister's office did not keep a transcript of proceedings. But one exists and, among talk of sustainable fisheries and the $1.15 billion Petrie to Kippa-Ring rail line, was a significant exchange between Gillard and one of the 400 locals on hand. The PM replied: ''I see in the media - and have heard sometimes face to face - some of the stories of women who face very devastating circumstances of having children taken, or being put under intolerable pressure to relinquish their children, in a different age and a different time. It was a ''sorry'' heard by few that has since reverberated to broken-hearted middle-aged and elderly women across the land. These are the mothers of the ''white stolen generations'', so-called to distinguish them from the mothers of the indigenous stolen generations, though their suffering is shared. In the five decades up to 1982, the newborn babies of these young, unwed women were forcibly removed from them for adoption. Their stories are shocking. They were drugged, tethered to beds, not allowed to see their babies, told they were dead. Margaret Hamilton had a son taken from her in Queensland. For Christine Cole - the founder of the Apology Alliance - it was a daughter. She says institutions such as Crown Street Women's Hospital in Sydney engaged in institutionalised baby farming, whereby those deemed inferior were taken and assimilated into the middle class. Cole was 16 when, in 1969, her mother took her to Crown Street, where she was given military-style mind-altering barbiturates in the lead-up to the birth. She never saw her baby daughter's face. After five days on drugs to dry up her milk and sedate her in her grief, she was made to sign adoption papers and sent home. An apology from the federal government - and to a lesser extent the states - is crucial to women like these two. NSW held an inquiry more than a decade ago. These women are still waiting for a parliamentary apology, not the statement of public acknowledgment the then treasurer, Michael Egan, gave to Parliament in 2001. At federal level, a Senate inquiry is under way, with a report due in April, but they fear a repeat of the Bringing Them Home report. It took more than a decade for one of its recommendations, a parliamentary apology to the stolen generations, to occur. The Prime Minister and premiers should follow the lead of the West Australian Premier, Colin Barnett, who, in October, in an Australian first, delivered a parliamentary apology on behalf of state institutions involved in the aggressive adoption practices and government policies that were unsupportive of pregnant, unmarried women. There was no political fallout, no avalanche of compensation claims, only joy and healing for the women whose babies were taken. Last week's personal ''sorry'' from Gillard, while cause for excitement among the women, is not enough. When Kevin Rudd examines the flaming wreckage of his prime ministership, he must reflect with satisfaction on the apologies he made on behalf of the nation. The first, in February 2008, was to the stolen generations. The second, in November last year, was to the forgotten Australians - the half-million Australian children and British child migrants who suffered years of neglect and abuse in orphanages and state and religious institutions. Some mothers of the ''white stolen generations'' are dead. Others are dying. Many live in despair, still longing for the chance to hold their baby, to see its face, to rewrite their sad history. They deserve parliamentary apologies. Without delay. Dec 8th 2010 - Liz Hannan. 25th Federal Cabinet Meeting at Clontarf Beach High School. Last night, Thursday 2nd December, I attended the 25th Cabinet Meeting of our Federal Politicians at Clontarf,(near Redcliffe) in Queensland. Our Prime Minister Julia Gillard, Jenny Macklin, Nicola Roxan and many others Ministers were there. "There were over 250,000 white mothers who had their babies forcibly removed at birth by the same past illegal adoption practices as Aboriginal Mothers. Do you personally feel that they should also receive an apology?" In front of aproxamately 500 people our Prime Minister answered my question. Julia spoke of the apology for the Forgotten Generation and The Stolen Generation and said she agreed that Kevin Rudd had done the right thing. and said she was aware of all the women still out there still needing recognition of the suffering they had endured. Julia then passed my question over to Jenny Macklin, who said that she was also aware many women still lived with the grief of loosing their children to past adoption practices. Jenny spoke of the Senate Inquiry and hoped we would all send in our stories. I was able to then add that we had many mothers in their 70's and 80's that thought they may not live long enough to hear rhe results of an inquiry, that an apology was what they wanted to let their children know that they "did not give their children away", that they were loved. Jenny said that she was aware of these older women. I have been given a contact card so I can speak some more to her advisor. I would have to say, I was most impressed with the forum and think my question was well answered. paper and post them in or go online and post online on the website below. "The Apology Alliance wants to formally thank the Greens for their ongoing support. formal apology to those affected by the policies. "Today's vote starts to recognise the suffering that so many people have endured as a result of forced adoption policies," Senator Siewert said today." document. The email must include full postal address and contact details. Demanding justice ... Christine Cole's daughter was taken in 1969. MOTHERS who were bullied into forcibly giving up their newborns before many had even cradled or seen them are demanding an apology from the NSW Government. Unethical and unlawful adoption practices were rife in Sydney hospitals, peaking between 1965 and 1975 when more than 36,000 children were taken from their single mothers under duress. The women were heavily drugged and bullied into signing adoption papers by doctors, matrons and welfare officers. Most mothers were refused the chance to see or touch their babies, the women's faces covered with pillows by nurses. Others were told incorrectly their babies had died. The practices that inflicted lifelong trauma and mental illness for mother and child were endorsed by successive governments, and carried out by hospitals and church groups to stamp out illegitimacy by assimilating babies into middle-class society. Christine Cole, whose daughter was taken from her in 1969, has been working with other mothers to get an apology from the NSW Government. "These practices were illegal and inherent in the system, that has already been established," Ms Cole said. "The NSW Government has ignored the recommendations made by its own inquiry. They are hoping we [will] all die off. "Last month, Western Australia became the first state to apologise to the women of the "white stolen generation", and last week the Senate agreed to hold an inquiry into the Commonwealth's role in forced adoptions. However, despite a parliamentary inquiry a decade ago into past adoption practices recommending an apology be made, the NSW Government has still failed to say sorry. "Mothers did not have a choice. If you are a victim of trauma, as we are, you cannot begin to heal unless your experience has been validated. An apology is long, long overdue," Ms Cole said. More than 200 women from around the country travelled to Perth to hear WA's Parliament "unequivocally and sincerely apologise for fundamentally flawed government policies" on October 19. Former MP Pat Rogan, who spearheaded the NSW inquiry, said he was "not just disappointed, but angry" that the Government had swept this under the carpet for so long. "I was delighted to see the [federal] apology to the stolen Aboriginal children, and some Aboriginal mothers said to me it was only right and proper the white stolen babies and their mothers be given a similar apology. The time has come." Psychiatrist Dr Geoffrey Rickarby, who has treated mothers whose babies were forcibly removed, said most Australians didn't realise the enormity of what happened. "[The now-closed] Crown Street Women's Hospital [in Surry Hills] had a machine going to take these babies," Dr Rickarby said. "Such serious things were done to these girls by the thousands. They were drugged silly and, immediately after the birth, the baby was taken. The mothers had their faces covered so they could not form a bond with the child. "At some hospitals the girls were tied to the bed. Most women never quite came to terms with what happened." He said people working within the authorities often "ordered" babies for themselves and friends, and adoptive parents were poorly screened and rarely rejected. "All sorts of people were adopting the babies, including mentally ill people, alcoholics and people with gross expectations about what the baby should be," Dr Rickarby said. The Government had much to apologise for, he said. "If these women get an apology, they will feel more socially included, and feel that people have compassion for them," he said. "Children will see the circumstances of their adoption, as many believe they were given up by somebody who did not want them, when that is incredibly untrue. "The Government has a lot to apologise for." Hospital staff lied and told Robin Turner, 60, her son had died days after his 1967 birth. Her baby was taken to another hospital, without her permission, and she was told later he had passed away. "In 1980, I fell pregnant again, and I high-tailed it straight to the pre-term clinic," Ms Turner said. "I could not go through it again. I never married because I am not worthwhile - it has affected every area of my life." NSW Community Services Minister Linda Burney told The Sunday Telegraph: "The majority of the recommendations from the inquiry into adoption have been implemented. One of those recommendations was that the NSW Government should 'issue a statement of public acknowledgement that past adoption practices were misguided and that, on occasions, unethical or unlawful practices may have occurred causing lasting suffering for many'. Thanks to Apology Alliance for this article. We would like to invite you to join us at our Christmas Lunch to be held at "The Ox," Oxley Ave., Margate. Date; Saturday 11th December 2010. Contact Trish; 0417 077 159 or Marg;0402 336 480. In 1966 when I was born my mother named me Paul. Five days after my birth, I was stolen from my mother by forced adoption practices in Queensland. At 12 days old I was given to strangers by Social Workers employed by the Government. These strangers gave me a new identity and a new name and called me, son. The government Department, Births/ Deaths/and Marriages then compounded this false identity by issuing a Schedule Birth Certificate which was a legal document consisting of lies. I then had to live with this false identity. When I reached the legal age of 18 years, I wondered, “Where were the Social Workers who deemed this to be, in my best interest, where were they to check if this was indeed, “For the best interest of the child”. No one came to inquire if I was ok, or if I had good adoptive parents. No one asked me if I wanted or consented to being adopted! I have lived this false life for over 40 years now. My name, my true self. The special bond that exists between a mother and child. My mother’s love and caring from my birth onwards. My siblings and my extended family. The right to my birth name and to enjoy my heritage and for my blood line to remain unbroken. My children to continue with my heritage and to know who they truly are. The best and honest interest of the child would have been to stay with his mother. THIS WAS NOT ALRIGHT THEN AND IS NOT ALRIGHT NOW! I have lived my life as a lie. Paul’s birth certificate states, Son of Margaret. These two people, can never officially celebrate Birthdays, Mother’s day, Marriages, Birth of Grandchildren or even Deaths as Mother and Son. These two people can only be joined on a piece of paper that is the first true Birth Certificate. Even in death we will not be recognised as mother and son. I am two people with two birth certificates which both say different things. MOTHER AND SON FIVE DAYS AFTER MY BIRTH. WHO CAN TELL ME HOW I CAN BE LEGALLY RECONNECTED TO MY TRUE SELF? Vaccine is prepared in 1956. A Federal Government agency used babies in Victorian orphanages and children's homes to test a new quadruple antigen vaccination, which included polio vaccine possibly contaminated with a monkey virus since linked to cancer. Commonwealth Serum Laboratory records show the trials were conducted on babies as young as three months in five institutions between December 1959 and early 1961. Quadruple antigen, containing Salk polio vaccine, was not publicly released until November 1960. The Age revealed on Saturday that millions of doses of Salk vaccine produced by the then government-owned CSL between 1956-62 were contaminated with a monkey virus called SV40. Researchers have found traces of the virus in a range of human cancer cells, including mesothelioma lung disease. It is not clear from the CSL records whether polio vaccine used to produce quadruple antigen used in the tests came from contaminated batches. Federal Health Minister Tony Abbott has ordered a departmental inquiry into CSL's decision to release contaminated vaccines. The National Health and Medical Research Council said it would work with federal health authorities to assess the need for more research into possible links between SV40 and cancer. Health authorities have stressed there was no proven link between SV40 and cancer and have also reassured the public that polio vaccines still routinely given to all babies were safe and free from the virus and other known contaminants. But a national support group for victims of contaminated medical products yesterday called for a royal commission into CSL. "The track record of CSL demonstrates the need for a royal commission into all their operations," said Independent Blood Council president Charles MacKenzie. CSL research records in the National Archives show that 56 babies under the age of 12 months were used in the Victorian vaccine trials. One baby died of meningitis in August 1960, less than three months after completing a course of three quadruple antigen injections. The records list the names of the institutions, the names and ages of the babies, the doses given and the results of blood tests done before and after the vaccinations to measure polio antibodies. The institutions used in the trials were St Joseph's Home in Broadmeadows, Berry Street Foundling Home, Bethany Babies Home in Geelong, Methodist Babies Home and the Children's Welfare Department at Turana, run by the Victorian government. There is no indication of who gave formal consent for the babies to be used in the trials, which were carried out by CSL's virus research department. Further development and use of the quadruple antigen, which also provided vaccination against whooping cough, diptheria and tetanus, appeared to have been abandoned during 1962-63. Salk vaccine was replaced with Sabin oral polio vaccine by 1965. The Age has revealed that in 1997 Victorian children's homes and orphanages had been used by a number of medical and research organisations, including CSL, for trials of a range of experimental vaccines. The reports led to inquiries by the state and federal health departments, which concluded there was no evidence of any other similar medical trials. Neither report referred to the quadruple antigen trials. The State Government report, a copy of which has been obtained under freedom of information by Melbourne researcher Brenda Coughlan, found no record of the Department of Human Services providing formal consent for state wards to be used in trials. The Age's revelations were examined by the Senate's inquiry into mistreatment of state wards, which said in its report in August that it was unclear who was legally responsible for allowing the children to be used. It concluded that any long-term health effects on children used in the experiments were unknown. The experimental use of quadruple antigen was investigated by a commission of inquiry in 2003. Rachel David, director of public affairs at CSL, said community attitudes at the time of the quadruple antigen trials in Melbourne were very different. She said it would have been a logical decision to trial the new vaccinations in such institutions because "lots of kids died of communicable and vaccine preventable disease" in them. Thanks to Apology Alliance for this information. Give us back our Baby Story.Weekend Australian Magazine October 30-31, 2010. Weekend Australian Magazine, October 30-31, 2010.
were suspicious of the western system of medicine. They were suspicious of authorities, after all they had escaped here because of Tiananmen Square! the brain into the abdomen. Mr Lee was full of doubt about the procedure. He asked the neurosurgeon if his daughter would die if he did not operate. State welfare services stepped in and took the baby into state care and wheeled her away for surgery. Her parents never saw her again, but not because she had died. THE STATE WELFARE SYSTEM NEVER GAVE HER BACK. consent to an operation on her brain on the first day. been fighting to get her back. An adoption order was placed before Judge George Palmer of the Supreme Court. He is a Father, Grandfather and a devout Catholic. The adoption of the child was granted to the foster parents. This is only the outline of the story. Mr Lee and his wife have three children. having to prove he is not! by Jan Kashin from Apology alliance. has been with the little girl’s “best interest at heart”? Where have I heard this story before? nursery windows while they tried to glimpse their babies. morning as I read the plight of Mr Lee, his wife and their three children. pain, suffering and emotional trauma. In a word they are all condemned to despair. Could Linda Burney’s Department have your infant in her sights to pick up the shortfall in numbers of newborns for adoption in the State of NSW? We hear complaints about the adoption numbers being so low, but no-one states the reason – we are no longer stealing thousands of newborns from their single mothers. So will this be the new baby grab? Will this be legalised by the courts; facilitated by the hospitals and enforced by the police? Many unanswered questions! Why was the baby not returned to her parents five years ago after the operation? She had competent parents who wanted her. The foster parents wanted to adopt her, well her real parents wanted to keep her, what about their rights? To say the child has got used to her new parents, what a travesty - that should never have been allowed to happen in the first place. One last point there are many children who grow up with a set of parents who separate, how would the community feel if one parent said to the other parent and family you can no longer have contact with your child because it would disturb him or her. It is my opinion that Justice Palmer’s ignorance of the damage caused by adoption has created a preventable tragedy. An immoral practice such as this is NEVER in the victim’s best interest. Our next meeting will be a northside meeting. We will have viewing of WA Apologies. 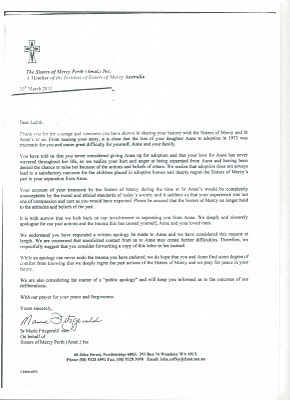 There will also be the written copies of the WA apology available. Starting time 12 o'clock onwards. Contact; Trish 0417 077 159 or Marg; 0402 336 480. Our apologies for cancelling the southside meeting. Letter from Andrew who was at Parliament to hear the Apology. some of you have hurt feelings. We're sorry your feelings got hurt." speakers from both parties acknowledging that great wrong was done. party a speaker was from, which is as it should be. up by a whole community. countries it is absolutely something worth working for. notice. But I hope it will be handled better next time. even mention it - what, do parliamentary apologies happen every day? Personally, as an adoptee, it had one very difficult emotional result. if not impossible, thing to face. Anyway, love and support to you all. Thank you Andrew for taking the time to share your personal experience with us. and click on the Legislative Assembly for Tuesday the 19th of October. Enjoy! Thanks Evelyn for the link. 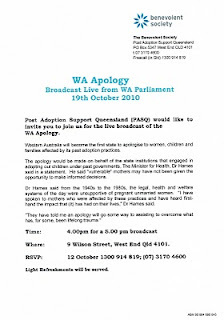 Link to WA Parliament to see the Historic Apology to Unwed Mothers. beginning of the apology. It was deeply moving. Thanks Chris for the link. This is the link to an interview in WA. Some of the hospital footage from the past adoption practices is inhuman! 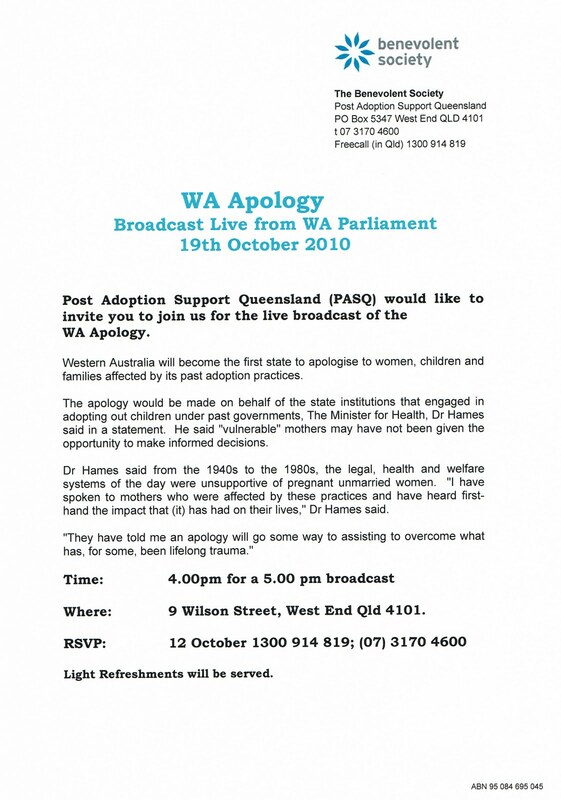 Western Australia will extend a Parliamentary apology to women and their children affected by its past adoption practices on Tuesday, October 19, 2010, at 3:00 p.m. Western Standard Time. Origins-USA applauds Western Australia's recognition of its part in separating mothers and their children, and its acknowledgement of the lifetime adverse affects of adoption. Comment on our post; "West Australia to apologise to unwed mothers"
idea what is going to be said on the day, or who is going to say it. way – you will not be able to take credit for the work of others. Join With Us On Our Special Day19th October to Commemorate the Western Australian Apology to Mothers and Their Children Separated by Past Adoption. We invite you to join with ALAS at the Royal Brisbane Women's Hospital to view the permanent display of our framed Historic Apology. Please bring along a flower which we will then place in the garden in the front of the hospital,under the flags. We will listen to words by a guest speaker to commemorate this special day. We will then have one minutes silence to remember all mothers separated from their children by forced adoption practices. Lunch will be at a convenient place to be decided on the day. We will meet at the front of the Royal Brisbane Women's Hospital under the flags. 11.45 am for a 12 O'clock start. If you are continuing on to PASQ, (see previous post)for the live broadcast, you will need to RSVP PASQ by,12th October,1300 914 819. MARK COLVIN: This evening the nation's first Indigenous Member of Parliament Ken Wyatt has delivered his maiden speech in the House of Representatives. He's paid tribute to his mother, who was a member of the Stolen Generations and thanked the former prime minister Kevin Rudd who was watching on. KEN WYATT: When the former prime minister delivered the apology on the 13th of February 2008 in this chamber, I shed tears for my mother and her siblings (holding back tears). My mother and her siblings, along with many others did not live to hear the words delivered in the apology, which would have meant a great deal to them individually. I felt a sense of relief that the pain of the past had been acknowledged and that the healing could begin. Mr Speaker at that point the standing orders prevented an Indigenous response. On behalf of my mother, her siblings, and all Indigenous Australians, I, as an Aboriginal voice, in this chamber say thank you for the apology delivered in the Federal Parliament. And I thank the honourable Kevin Rudd for honouring his commitment to the Stolen Generation. MARK COLVIN: Ken Wyatt, the nation’s first Indigenous MP, delivering an emotional maiden speech in the Federal Parliament tonight. ALAS would like to congratulate Ken Wyatt MP on his maiden speech. Ken recognised the importance of an Apology so that the healing could begin. We hope the Federal Government can do the same for our White Stolen Babies taken from their mothers by forced adoption practices of the past. Here is the link to listen to this interview. to the House to hear the apology, which is expected to start at 3.00.
thinking of all of you who are not able to be there. Story went national - this we know. Reuters have asked for copy so gone international. SOUND BYTES AND REFERENCES: NB: This is not about adoption. The Parliament of the Commonwealth of Australia: Overseas Adoption in Australia: Report on the inquiry into adoption of children from overseas House of Representatives Standing Committee on Family and Human Services November 2005 Canberra"The stigma associated with forced adoption practices in the past leading to the 'stolen generation' (both Indigenous and non indigenous mothers and children)" (p.2). JM: What do you say to the fact that some mothers say there is a ‘white stolen generation’? GR: It’s true … there is a white stolen generation as well as a black one. And if you look at the white generation numbers, there is a lot more of the white generation that were stolen than the black generation. JM: Why then would it not be recognised? GR: Oh, I think it is, in a way, but people do not want to open the door … it is almost too big a problem to deal with … if people had of opened the door to somebody proving that illegal things were done, it would have opened up a huge lot of problems for the Crown Law Department ... to undo a whole lot of things that happened … they want it to go away … it is a complication they could do without. JM: You mean it is an inconvenient truth? (p.58) "Bernoth (1999) and Olsen (2004) identify that the moral bullying of Australian single mothers resulted in a 'white' stolen generation." “It is very desirable, however, both for the child’s physical health and for the mother’s psychological well-being that there should be greater facilities for unmarried mothers to keep their children with them for up to three months after birth…. [and] that a document signifying the consent of a mother shall not be valid unless the infant is at least six weeks old when the consent is given, was intended to ensure that children below that age were not placed for adoption…we found little disagreement with the view that it is preferable for a child not to be taken away from his mother before the age of six weeks (Report of the Departmental Committee on the Adoption of Children: 1954, pp. 14-15). In Australia in "1958 the Special Committee on Native Matters warned that `removal of a child from his mother at an early age can cause serious psychological and mental disturbances'. This warning was ignored” (WA Government submission page 26 cited in HREOCR Chapter 7). Justice Richard Chisolm – Review of the Adoption of Children Act. Report No.69. He stated that the practices were illegal. “A primary principle of international law is that a child has the right to be brought up in its family of origin. This principle was supposed to have been followed in Australia. Further, a single mother was, and is, allowed by law and common human decency to have the right to see, hold and feed her infant. She had the right to name her child and to have unfettered access to her baby in the maternity hospital. When a child is born to a single mother, it is not subject to adoption legislation; its mother is the legal guardian and has the same rights as any other mother. Legally, the Adoption Act does not come into operation until the mother signs a ‘consent to adopt’ form and then only if the consent is informed and taken without duress or coercion. Separating a mother from her child, or placing pillows or sheets to obstruct the view she has of her baby at the birth in order to facilitate an adoption was, and continues to be, classed as coercion and is therefore illegal. Injecting mothers with drugs to dry up their milk immediately after the birth, without their permission, was and is illegal and deems to presume that the mother has already signed a ‘consent to adopt’ form. Dr. Geoff Rickarby has stated that the act of injecting a mother with stilboestrol immediately after the birth constitutes a major assault as mothers were not informed that this would occur and the routine ‘consent to necessary procedures’ that patients sign on being admitted to hospital would not cover the consent to have their milk dried up by an injection. A mother was supposed to be warned of the ‘dire psychological consequences’ that could result because of her decision to relinquish her child. She was also supposed to be advised of all means of financial assistance available to her to assist her to keep her child. It was only after all alternatives to adoption and means of available support had been explored, and if the mother continued to insist on adoption, that the papers were brought to her to be signed. No decision was supposed to be made prior to the fifth day after the birth or if the mother was distressed. If the mother was not definite in her decision, she was legally entitled to leave the hospital with her baby and to make the decision weeks or months later. … the child must be protected from unnecessary separation from his own family and that there should be no attempt to persuade the natural parents to place the child. Many mothers were given large doses of drugs prior to and after the birth, often right up until they signed the ‘consent to adopt’ form. Some of the drugs used were: sodium amytal, chloral hydrate and sodium pentobarbitone; all of which are mind-altering barbiturates. The curtailing of mothers’ rights and the above coercive practices meant that by 1972 there were nearly 10000 babies adopted by non-relatives in Australia. This extraordinarily high number of adoptions was a social aberration that did not occur before the 1960s and rapidly declined with the rise of the women’s movement in the early 1970s. Christine Cole -Reference from the book Releasing the Past. 7.62 The Committee therefore believes that the practice of denying a mother access to her child prior to the signing of consent was unlawful. Those professionals who contributed to the process where access was denied were clearly acting unlawfully. The departments, private agencies, churches, hospitals, professional organizations and individuals involved in past adoption practices should be encouraged to issue a formal apology to the mothers, fathers, adoptees and their families who have suffered as a result of past adoption practices. It is only when the suffering of those most directly damaged by a socio-cultural disaster are heard that there is any opportunity for a Nation to evaluate a malign aspect of its own development. In the instance of the thousands of Australian young mothers who lost a baby to adoption in the latter half of the last century, the distress and consequences are little known because they were dealt with one by one, and, at the time, mostly isolated from their family, partner and friends. Geoffery A. Rickarby MB BS FRANZCP MANZAP Member of the Faculty of Child Psychiatry RANZCP(A PSYCHIATRIST WHO HAS SEEN ALL ASPECTS OF ADOPTION OVER 35 YEARS) reference from the book “Releasing the Past. During the NSW Inquiry (1998-2000) into past practices in adoption, representatives of an Indigenous group that facilitates re-uniting Indigenous mothers with their stolen children gave evidence. They stated that Indigenous mothers were brutally separated from their infants at the birth. Those babies were subsequently adopted or fostered out. The removal of their children was undertaken by the same social workers and medical staff (in the same institutions and under the same laws), who were involved in the theft of white babies. They further stated that there was a common theme between the black and white stolen generations. For instance, Indigenous mothers told them of the use of pillows and sheets to obstruct their view of their baby at the birth with the intention to interrupt bonding, and of being forced to sign consents before allowed to leave hospitals while under the influence of drugs: the same procedures used to gain white mothers’ babies. 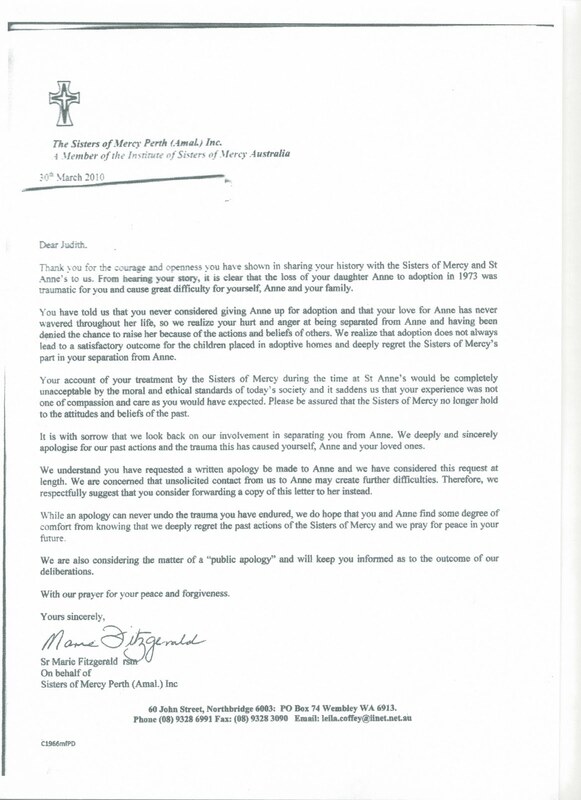 There has never been any question that these families are part of the stolen generation – and thankfully they have been apologized too – the loss of these mothers and their families has never been dismissed as social mores or explained away by statements such as the mothers did not have recourse to financial benefits. Furthermore it is now well established that money had been available to assist single mothers to keep their babies since 1912. From 1923 onwards single mothers were given the same financial assistance as deserted wives. The different outcome for single mothers though was that there was no Governmental push to remove the babies of deserted wives or widows – the reality was that white single mothers without family support, orphaned or migrant were preyed upon, our rights extinguished and for that we want and deserve an apology. NB this not about adoption – this is about how our children were stolen at birth, without our consent, this is a human and civil rights crime against mothers’ and their babies and should be acknowledged as such. On Tuesday,14th September 2010, we had the previllidge of witnessing a mother give her baby his name. NOTHING TOO STRANGE ABOUT THAT! This baby is now 35 years old. A young teenage mum was told she could not name her baby, the reason for this was, she was unmarried. Many hospitals and court registars took it upon themselves to deny a mother her right to name her baby. Adoptees grew up with the knowledge that the mothers couldn't be bothered naming them,THEY WERE WRONG. Yesterday here in Queensland, this couragous and determined mother had her right to name her baby fulfilled.The baby has always had a name but it wasn't officially recognised. We do not know if it is another "first" but with the help from Births/ Deaths/ and Marriages, this mother had her son's name placed on his original Birth Certificate. We were told that it is a case by case decision to amend a Birth Certificate but it is not impossible. CONGRATULATIONS MUM, YOU DID IT! Our September meeting is a northside meeting. We will be celebrating the Western Australian Apology to be delivered in parliament 19th October at 4pm western Australia time. harsh adoption practices is set to happen within weeks. apology have been told it will be delivered in Parliament on October 19.
children immediately after birth between the 1940s and the early 1980s. adversely affected by past adoption practices". origin and the culture of that family," she said. Forms From Child Safety, Royal Brisbane and Women's Hospital and St Mary's Home for Unmarried Mothers, Toowong Brisbane Available to Me In 1991. Is she living in a defacto association? On My Questionare; My Remarks said "Nice Girl"
On My Child's Remarks; said,Heavy Physio to feed, dated 5 days after his birth. My Child's custody was 12 days after he was born. This is addressed to The Director, State Childrens Department. M15 Room 8 by window on right hand side. Baby born on .....1966 at 8 20am. THE ADOP[TION OF CHILDREN ACT OF 1964. 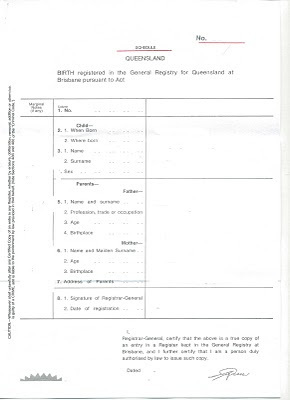 FORM OF GENERAL CONSENT BY PARENT OR GUARDIAN TO ADOPTION ORDER. I will try to copy this form and will post it on the blog soon. From the Royal Brisbane and Women's Hospital I was able to receive only limited paperwork. 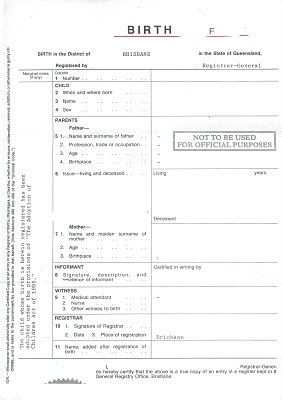 Registration of Birth/Death/ illegitimate child. I was at St Mary's Home Toowong Brisbane. The only record from there was my admission form. It was signed by Assistant Matron; M.Roby. I would be interested to hear if there are any more forms that I am entitled to have now. As recorded in the Hansard Records of Parliament Debates of both Victorian and W.A. Parliaments. Original Reasons For Adoption Laws. The original reason for adoption laws was to place "deserted" children in "good" homes rather than life in institutions:this was seen as a great saving to the State and one to be encouraged. Legislation was thought necessary so that when children were adopted they could not be taken from the adopters by the natural parents. The child retained the right to its own name, the name of the adopted father being added "in addition to the proper name of the child. "The child was also not deprived of its property rights and continued to be able to inherit from its natural parents. In 1896 Western Australian Adoption of Children Act was contained in only four pages and it was not untill 1921 that secrecy provisions were introduced at the request of adoptive parents. They objected strongly to the child retaining its own name and were even refusing to adopt unless the child bore "their name and their name only." (p.811 Hansard. 20thSept.1921) that "the past should be wiped out completely. "(p.809) and that the child "shall be bought up as their own child, unemcumbered by any other name whatever." (p.693 Hansard. 8th Sept1921. )The child's right to its Surname was removed in 1921 and to its christian name in 1949. "As each child would have cost the State for its maintenance 26 pounds per annum, the saving effected to the State for the children adopted is nearly 300,000pounds for 14 years." which he put forward as a reason in favour of the Adoption of Children Act which he was introducing to parlaiment. The whole object of the bill is to get the adopted child from its natural parents and prevent it from ever going back to them." In 1921 the W.A. Parliament, again request of the adoptive parents began the closing of the records by proventing the adopted child from obtaining a copy of its own Birth Certificate.This was so the ADULT/CHILD might not find out that it was illegitimate or adopted, if it had not been informed by its adoptive parents. "People should be afforded an opportunity to protect the secrecy of the child's origins and to let it appear before the world as though it were their own." Apart from wishing the child to appear before the world as their own, adoptive parents and politicians also desired to prevent "sticky-beaks" and "busybodies" from searching the records for "malicious purposes." It was for those reasons that provisions were made to close the records. "I maintain that a parent whose son or daughter is engaged to marry one of these people is entitled to know something of that person and whose son or daughter that person happens to be. A child born of vicious, drunken or criminal parents may have been taken into a respectable family and been given the name of the family. In the course of time that child may perhaps want to get married. I do not think anyone of us here would allow a daughter or son to marry such a child if we inquire into the heredity of the child and found out the conditions under which it was born." One might reasonably ask what about the adoptees right to privacy, no-one spoke about the "paramount importance" of the child in this instance. So the original reasons for closing the records was secrecy from illegitimacy and from the world and as a consequence the child was eventually deprived of its rightful name and heritage. On 22nd August our meeting will be held on a Sunday starting at 11 o'clock. The movie, Mother and Child is showing at the Redcliffe Cultural Centre starting at 2 pm.We thought we would combine both, as a lot of mothers have shown interest in seeing the movie. Karen, (Annette Bening) a reserve 50 year old nurse, who was forced to give up her daughter Elizabeth (Naomi Watts) for adoption 35 years ago has grown into a single-minded career woman; and Lucy (Kerry Washington)was desperate to adopt a child of her own. A profound and moving film about forgiveness, the choices we make, the chances we miss and the power of the unbreakable bond between a mother and child. We will try to make a group booking as seats are numbered, or you can contact the Cultural Centre; Phone 3283 0407. RSVP; ASAP to join us with the group booking. I have been informed tickets will go quite quickly. Please bring a plate to share for lunch. Our next meeting will be a north side meeting. One Year Anniversary of Royal Brisbane and Women's Hospital Apology. A Luncheon was held at the Golden Ox at Redcliffe on Wednesday 9th June to celebrate 1st year anniversary of our apology. It was nice to see the ladies and hear how the apology has had a positive effect on their personal journeys. This Newspaper article was found under some old kitchen Lino in my home. I think it was meant for me to find, as I was one of those "wayward girls," unmarried and pregnant in October 1965. Click on article to enlarge. Great news. I found today in my letter box the attached letter, ironic that being Good Easter Friday. When I checked the mail yesterday there was nothing in my letter box. I was incarcerated at what was called St Annes Unmarried Mothers Home in 1973 ( Catholic Run) during the last four months or so of my pregnancy. The hospital at the time was called St Annes in Mt Lawley ( Perth) now know as Mercy Hospital. I feel such relieve after all these years finally having some acknowledgment and the truth finally revealed at long last from those responsible for snatching my precious baby from me the moment of birth and put up for adoption, ( all illegal as we know) without my permission and express wishes I don't want my baby adopted out. our children for past practices - this has just been announced by Dr.
after giving birth out of wedlock. A NEW BABY? HOW EXCITING!!!!! WHEN YOU ARE BORN,YOU HAVE A BIRTH CERTIFICATE. IF YOU ARE ADOPTED,THE PAPERWORK, "THE CERTIFICATE" HAS THE WORD SCHEDULE ON IT,INSTEAD OF THE WORD BIRTH. UNLESS SOMEONE POINTS IT OUT TO YOU, YOU WOULD NEVER KNOW OR INDEED NOTICE THAT YOUR CERTIFICATE IS DIFFERENT TO OTHER PEOPLE'S PAPERWORK............PEOPLE,THAT IS,WHO WERE NOT BORN OUT OF WEDLOCK. THE LAW ONLY CHANGED IN 1991, THAT ENABLED ADOPTEES AFTER OBTAINING THEIR ADOPTIVE PARENT'S WRITTEN PERMISSION,MIND YOU, TO ACCESS THEIR CORRECT RECORDS PROVIDING THERE HAD BEEN NO VETO PUT ON THE RECORDS. ACROSS THE ORIGINAL BIRTH CERTIFICATE IS A NASTY LARGE RED RUBBER STAMP WHICH STATES, "NOT TO BE USED FOR OFFICIAL PURPOSES" OR WORDS TO THAT EFFECT. OKAY, YOUR ORIGINAL CHRISTIAN NAME IS THERE, WITH THE NAME OF YOUR BIOLOGICAL MOTHER,HOWEVER, THE NAME OF YOUR BIRTH FATHER IS NEVER RECORDED, EVEN IF IT IS KNOWN. UNTIL NOW, ADOPTEES HAD VERY LIMITED RIGHTS. ON THE 1st FEBRUARY, 2010, NEW ADOPTION LAWS WERE LAUNCHED AT PARLIAMENT HOUSE HERE IN BRISBANE. MORE THAN 3,000 QUEENSLANDERS WILL BE ABLE TO VIEW INFORMATION THEY WERE PREVIOUSLY BANNED FROM SEEING. HOWEVER, ACCORDING TO ADOPTION CAMPAIGNERS, THE CHANGES ARE A "BAND-AID SOLUTION TO A BROKEN LEG" AS ADOPTEES WHO VIEW THE DOCUMENTS FIRST MUST SIGN A WAIVER SAYING THEY WILL NOT CONTACT THEIR PARENTS, OR HOLD THE GOVERNMENT RESPONSIBLE FOR ANY PAST DECISIONS. IT IS A NATURAL BIRTH RIGHT TO KNOW WHO YOU ARE. IF YOU ARE NOT AN ADOPTEE, YOU SIMPLY TAKE IT FOR GRANTED. YOU KNOW YOUR MEDICAL HISTORY, AND THAT OF YOUR FAMILY. YOU GO TO A MEDICAL PRACTITIONER, THEY ALWAYS ASK FOR YOUR FAMILY HISTORY. MOST PEOPLE CAN RATTLE OFF THINGS, SUCH AS AUNT BESSIE HAD DIABETES, UNCLE ALF HAD DEMENTIA, HIGH BLOOD PRESSURE OR STROKE KILLED MY FATHER. EVEN WHEN LIFE INSURANCE IS TAKEN OUT, THERE ARE ALWAYS QUESTIONS REGARDING FAMILY MEDICAL HISTORY. THE ANSWERS TO THESE QUESTIONS EFFECT YOUR PREMIUM. THE ADOPTEE ONLY CAN SAY, "I DON'T KNOW, I AM ADOPTED". THIS NEW LEGISLATION, WHILE MOST WELCOME DOES NOT GO FAR ENOUGH IN ADDRESSING THE NEEDS OF ADOPTEES. A STEP IN THE RIGHT DIRECTION......YES. To our knowledge,an estimate 10 in 100 are unlawfully tended vetoes. If an adopted person does not know he/she is adopted and there is a veto, it could have been placed with the adoptee's name on it but without their consent. the secret of his/her adoption would stay hidden forever. This means, the adoptee may never know of the veto. Their real birth identity, birth parents, family and heritage would be lost to them. Before signing the new No Contact Form, contact the Department of Child Safety to have them establish the legality of the veto and to ensure it was a lawfully tended document by the person in question. Five ALAS(Adoption Loss Adult Support) and three WASH(White Adoptees Stolen Heritage) members along with other groups involved with adoption, were invited to the launch of the new Adoption Laws and Post Adoption Support Services, (PASQ) at Parliament House on 1st February 2010. Minister Phil Reeves MP,The Benevolent Society,Mr. Richard Spencer and President of Jigsaw, Trevor Jordan spoke at the opening. PASQ has been established with an investment of $1.2 million over three years. Jigsaw is a government sponsored group. The Act requires a child's mother and father and every person who is a guardian of the child to freely and voluntarily consent to the child's adoption.The Act includes a number of measures designed to ensure a person's consent is both informed and given voluntarily. For example, a parent can only consent to their child's adoption after they have received written information about adoption that includes alternatives to adoption and financial support available to them. The Act requires that this information must be explained through pre-consent counselling. In addition, the Act allows for adoption care agreements to be made for a child for up to one year, while parents consider providing consent to their child's adoption.Past experience and research indicates parents need time to consider all care options available to help ensure consent to a child's adoption is only obtained once a parent has had time to fully explore all the issues and options for their child's care. The Act provides parents with a revocation period of 30 days from the time the initial consent to an adoption is provides. Information and counselling will be provided to parents to ensure that they understand the consent process and their right to revoke consent within this timeframe, as part of pre-consent counselling. The new law balance people's right to information about their birth parent, son or daughter who was adopted with the right of others to maintain their privacy. Previously more than 3000 Queenslanders affected by adoption that occurred before 1991 were prevented from obtaining identifying information about their birth parent or son or daughter who was adopted. The new law will give these people the right to access information about their own identity or that of a son or daughter for the first time. PASQ phone; 07 3112 5182 or 1300 914 819. This meeting will be held northside Brisbane. We are delighted to have as our guest speaker, the Team Leader from PASQ (Post Adoption Support Queensland). We are looking forward to hearing how this new Support Services will be of benefit to us. With the new Adoption Law changes, most mothers and adoptees will now have the opportunity to have information previously denied to them. A gold coin donation would be appreciated. Laws giving adopted children and their birth parents greater access to information about each other are among a raft of measures coming into effect in NSW today. Community Services Minister Linda Burney said that under the changes, children would no longer need to be 18 before identifying information could be released. "Worldwide research shows that adopted children benefit enormously from developing a strong sense of identity knowing who they are and where they come from," Ms Burney said yesterday. "Regardless of how loving and caring the home adoptive parents provide, it's human nature for children to want to know about their history, culture, biological family and possible brothers and sisters. Similarly, birth parents and siblings may want to know about the adopted child." Ms Burney said there would still be strict controls over the information. 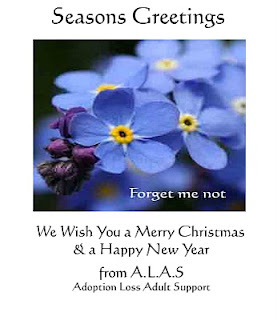 "Before information about an adopted person under 18 years is released, a careful assessment will identify any issues. Records will be checked and adoptive parents consulted." Our first meeting will be Brisbane southside. At this meeting,a guest speaker from Child Safety Services will talk with us and answer our question on the New Adoption Laws.